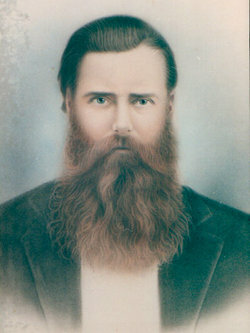 Portrait of Oney Pickney Randall taken circa 18951). One year before his death (at age 48). 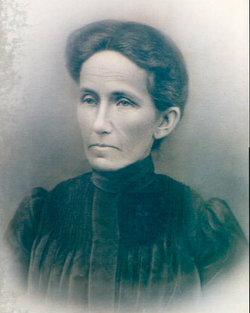 Photo of Elizabeth Mahaley Gwinn Randall taken circa 19092) at age 60 (Nov. 26, 1849 - Sept. 21, 1941). 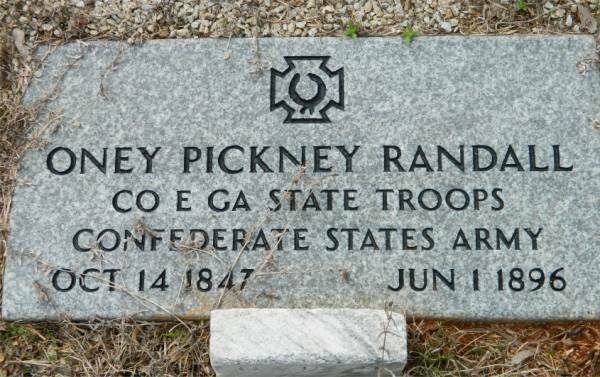 Son of Oney Cypress Randal and Susannah (her full name may be “Susannah W. Wilkins”), Oney Pickney Randal was born October 14, 1847 in Franklin Co., GA.
Oney (O.P.) served in Company E of the GA State Troops Confederate Militia. 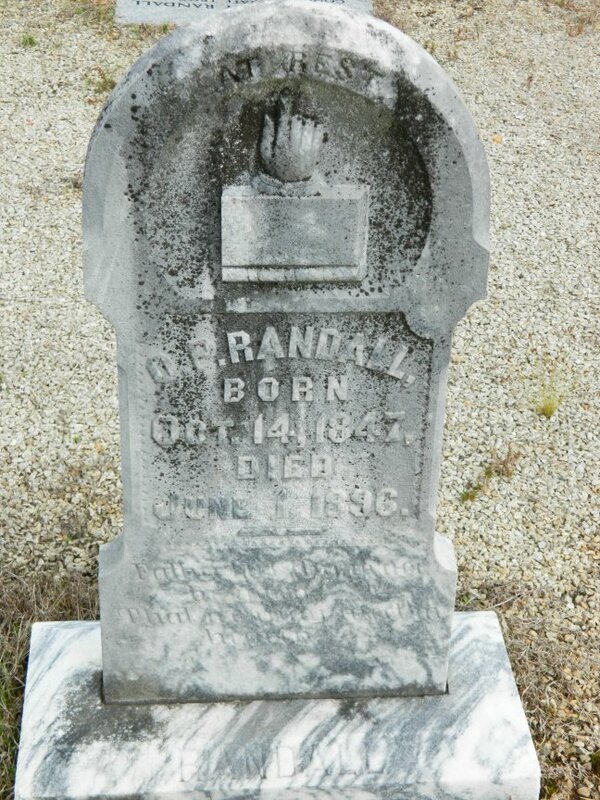 Lola Ethel Randall (Dec. 14, 1886 - July 22, 1889)9) Died in childhood at 2 ½ years old. Thomas Estes Randall (May 22, 1883 - May 2, 1919) Married Burmah Carroll. Died from Meningitis at age 36. When it came to baby names, Oney & Elizabeth were very much “in tune” with the pop culture of their time! The name “Ida” was the 7th-most-popular female name during the 1880s. So when Oney & Elizabeth named their first daughter “Ida” in 1869, they were on the “cutting edge” of pop culture for their time. The name “Ida” slipped into disuse in subsequent decades. In the 1870 U.S. Census, we see that Oney and Elizabeth were living with his mother, Susannah. And that Oney and Elizabeth had a 9 month old daughter, Ida Alice Randall. 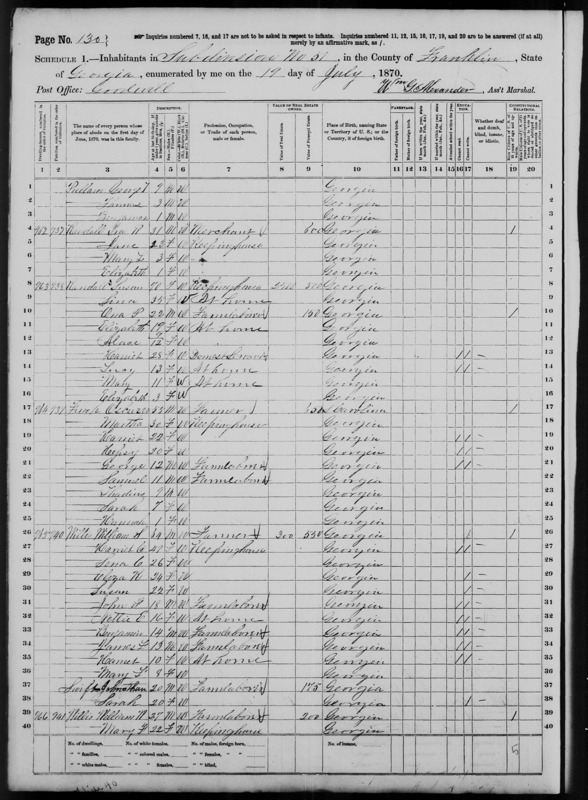 1870 U.S. Census. Susannah Wilkins Randall's family begins at line 8. Note: While the 1870 census does not indicate the relationships, Susan was actually Susannah (widow of Oney Cypress Randall). Ona was actually her son, Oney Pickney Randall. Elizabeth Randall (age 19) was Oney's new wife… and Alace (Alice) Randall was their 9 month old daughter. While Harriet Randall, the domestic servant, was indicated as having been white, her relationship with Susannah is not known. And we can only speculate that the three youngest girls, Lucy, Mary & Elizabeth, were Harriet's daughters. 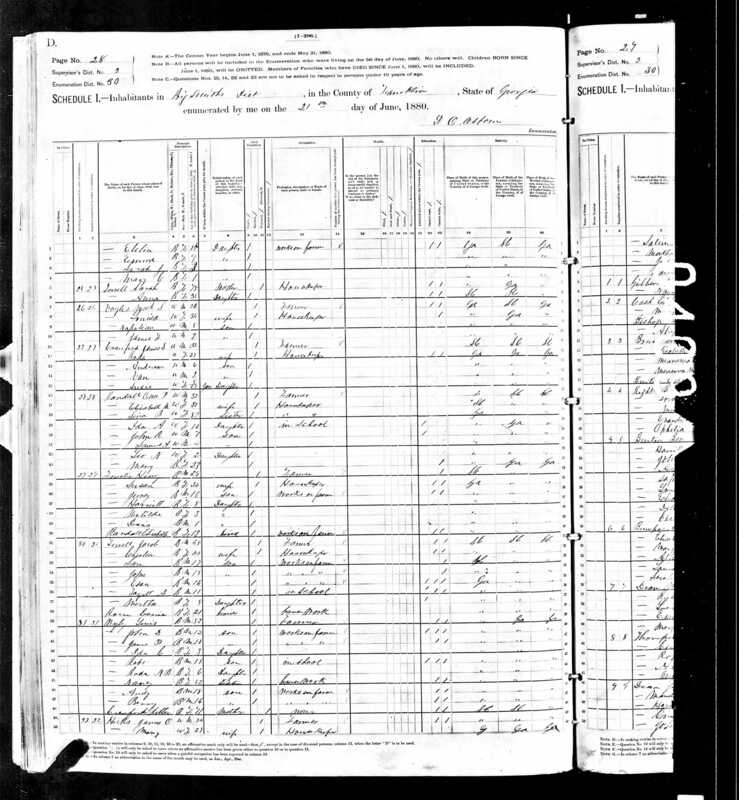 After Oney's mother died (in 1874), we see from the 1880 U.S. Census that his sister, Sina B. Randall, was living with Oney & Elizabeth Randall. 1880 U.S. Census. Oney's family begins at line 16. Post Office: Big Smiths Dist. Note: Below Leo's name appears a “Mary Randall”. A black female 23 years old. Mary's occupation is not listed. 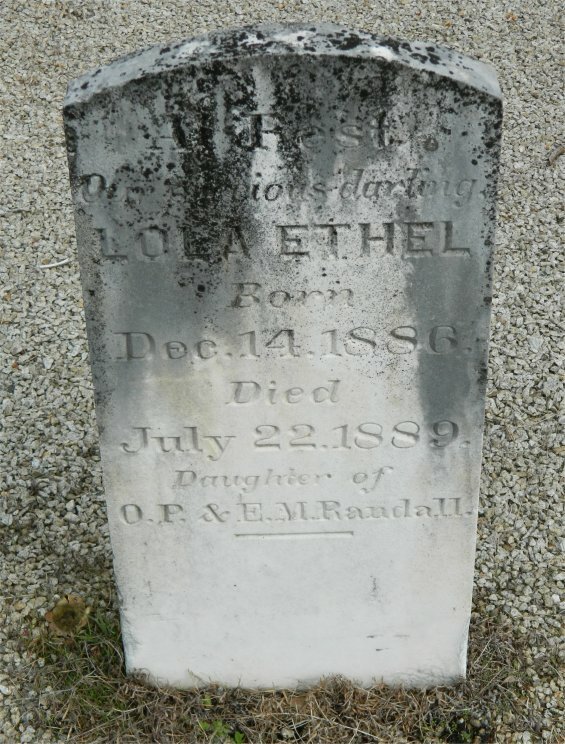 On Dec. 14, 1886, Oney & Elizabeth had a daughter named Lola Ethel. Lola died on July 22, 1889 (from unknown causes). Lola was 2 ½ years old at her death, and is buried in “Martin Community Cemetery” (aka “Martin City Cemetery”) Martin (Stephens County) Georgia. Most of the original 1890 U.S. Federal Census records were destroyed or badly damaged by a fire in the Commerce Department in 1921. Records enumerating only 6,160 individuals—less than one percent of the schedules—survived. Those for the Randall family were destroyed. Oney died on June 1, 1896 (at age 48) in Martin, Georgia; and is buried in “Martin Community Cemetery” (aka “Martin City Cemetery”) Martin (Stephens County) Georgia.12) Oney's widow (Elizabeth M. Randall) applied for a pension as a widow of a Confederate veteran. A hand with the index finger pointing up symbolizes the hope of heaven, while a hand with the index finger pointing down represents God reaching down for the soul. The finger pointing down does not indicate damnation; instead it most commonly represents an untimely, sudden, or unexpected death. A hand with a finger pointing at a book typically represents the Bible. Clasped hands usually indicate marriage or sometimes God's welcoming the deceased into heaven. 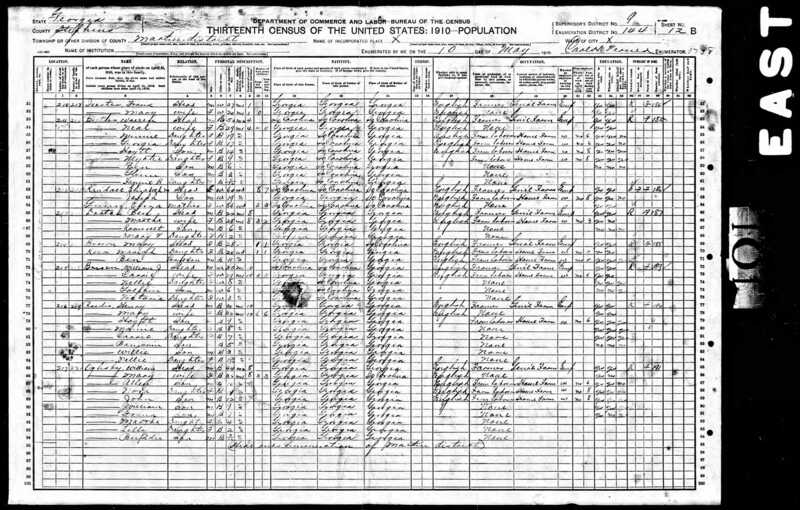 1900 U.S. Census. Elisabeth M. Randall's family begins on line 64. 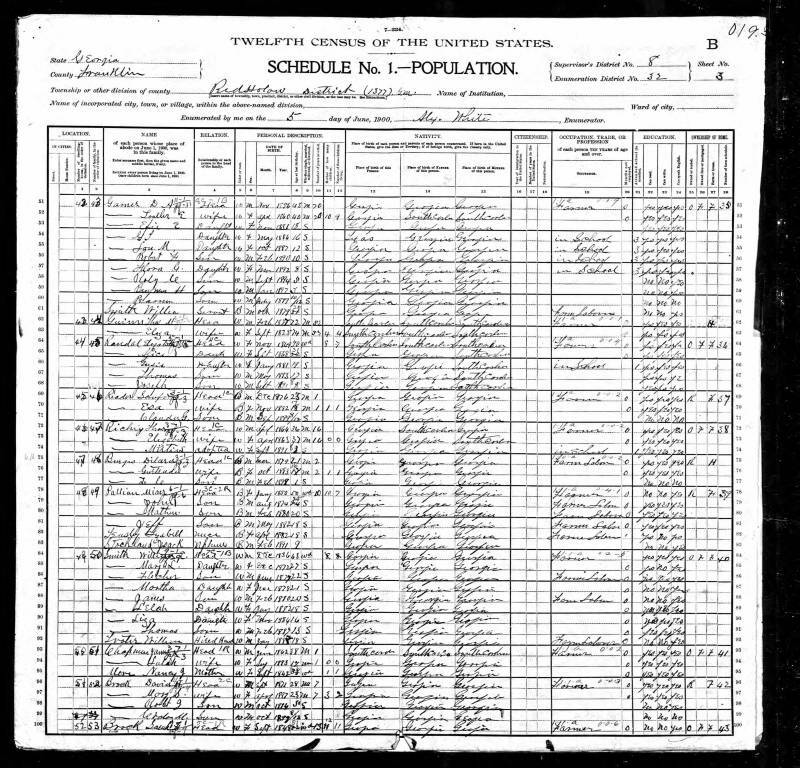 Note: Elizabeth Randall's parents, Thos M. & Eliza Gwinn, lived next door; and appear on line 62 of this census. 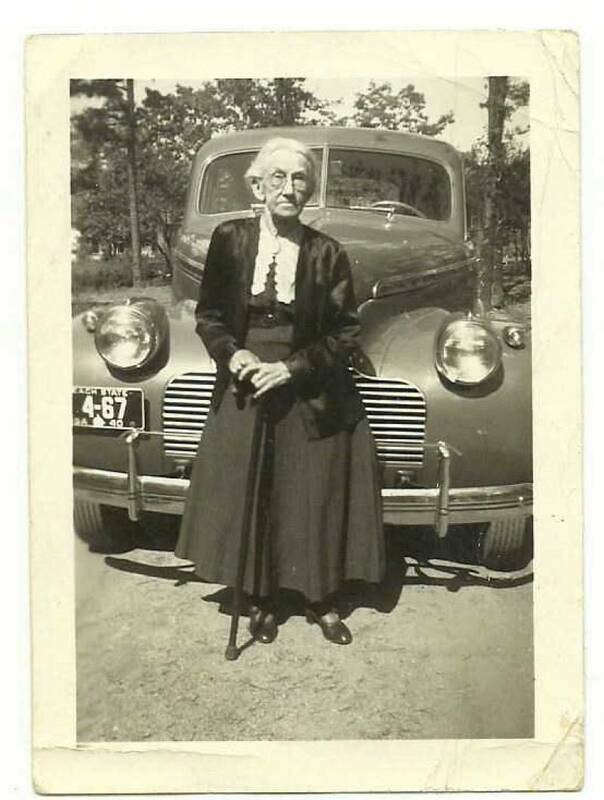 By 1910, Elisabeth M. Randall's father had died, and her 84 year old mother, Eliza Gwinn, was living on River Road, Martin , GA; along with Elizabeth's youngest son (Joseph). 1910 U.S. Census. Elisabeth M. Randall's family begins on line 62. Township or Other Division of County: Martin Dist. Note: Eliza “Guine” also indicated that she had 3 children. 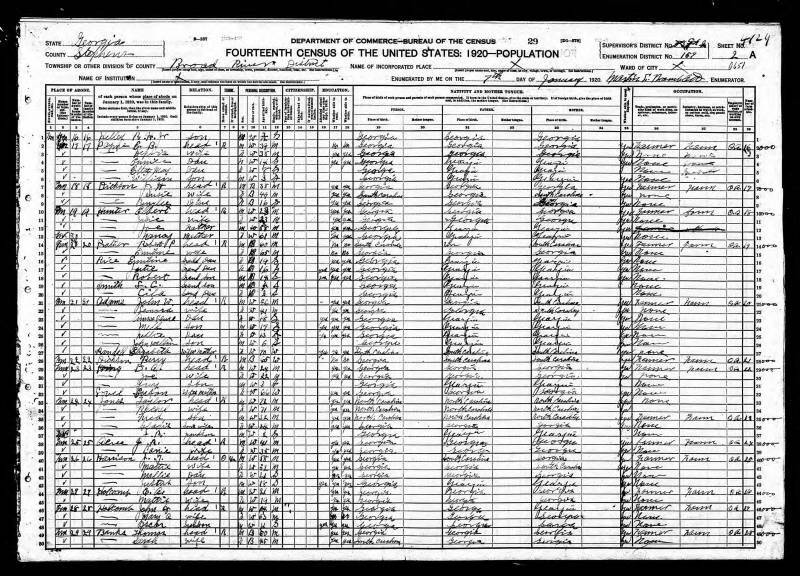 All were still alive at the time of this census. By 1920, Elizabeth M. Randall was living with her daughter, Frances Leonora "Leo" Randall-Adams, and her family. 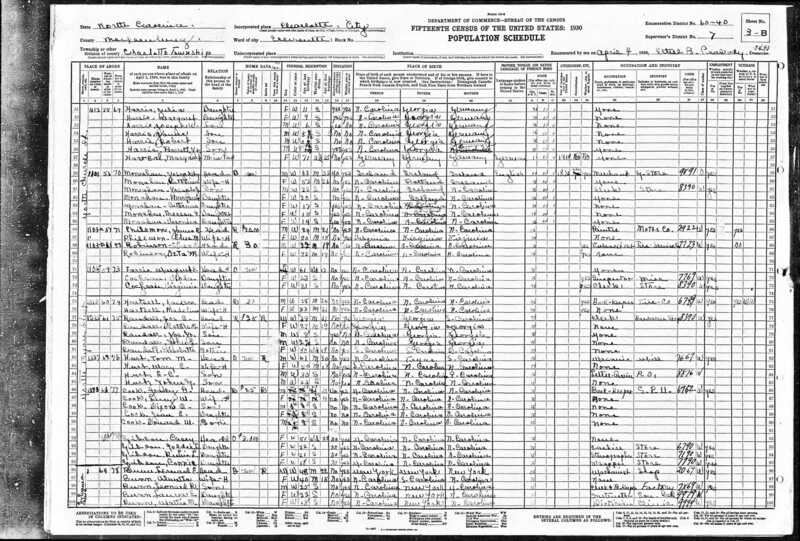 1920 U.S. Census. 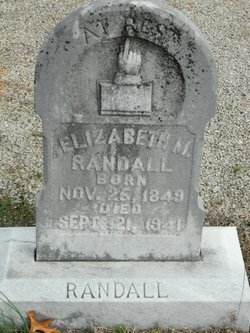 Elisabeth M. Randall is listed on line 27. Township or Other Division of County: Broad River Dist. By 1930, Elizabeth M. Randall had moved to Charlotte, North Carolina and was living with her son, Joe C. Randall, and his family. 1940 U.S. Census. Elisabeth M. Randall is listed on line 81. 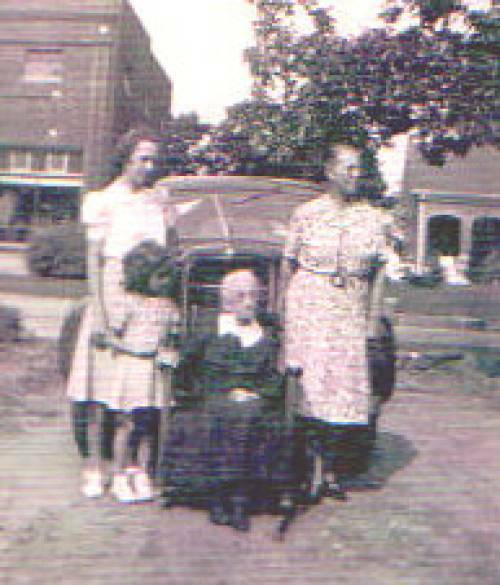 By 1940, Elizabeth M. Randall had returned to Georgia, and was again living with her daughter, Frances Leonora "Leo" Randall-Adams, and her family (who had moved from Stephens County to Habersham County). 1940 U.S. Census. Elisabeth M. Randall is listed on line 75. 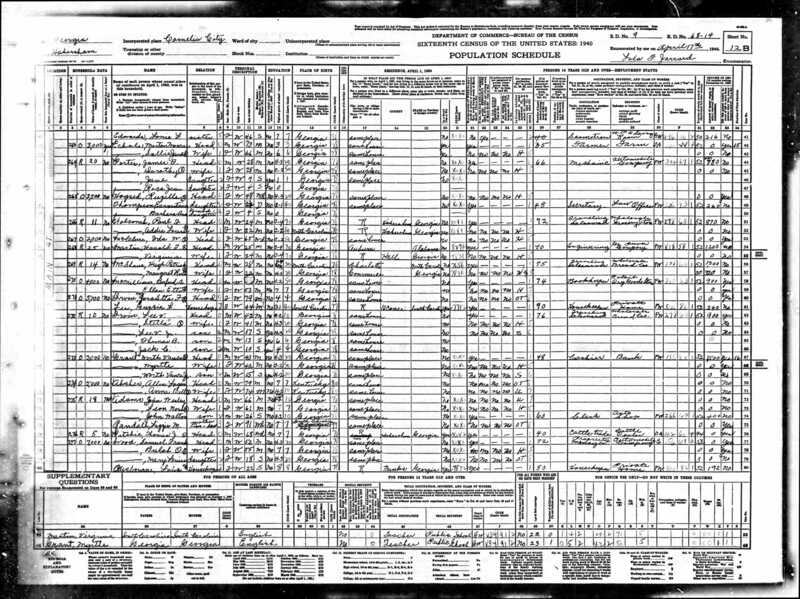 Source: “United States Census, 1940; Census Place: Cornelia, Habersham, Georgia; Roll: T627_681; Page: 12B; Enumeration District: 68-14. Elizabeth M. Randall. Circa 1940.